In 1924 plumber Gust Hoglund started plying his craft in the Park from his home located just southeast of Wooddale Lutheran Church. From 1943-47 he was located at 3900 Xenwood Ave., which was apparently his home. In 1951-55 the company was located at 6532 W. Lake Street. In 1955 the company built a new building at 7420 West Lake Street. By 1961 the one-man operation had grown to a plumbing and heating corporation employing 50 people and headed by Gust’s son Don. In 1964 the company offered two new products: the Pleasure Pool – a low-priced, above ground family swimming pool that could also be used as a skating rink in the winter, and the Thermasol home steam bath. 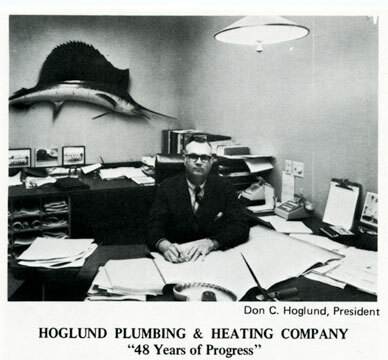 In 1971 there are separate entries in a Sun business supplement for Hoglund Heating Co. (Joseph H. McCormick, president – 20 employees) and Hoglund Plumbing Co. (Don C. Hoglund, president – 75 employees). The 1971 in which the photo below appeared said that the company had a staff of 70 mechanics and a fleet of 20 trucks and handled commercial and industrial work. 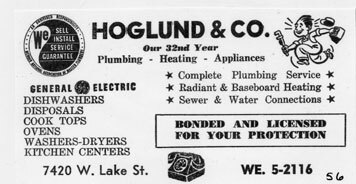 In 1975-84 it was listed as Hoglund Mechanical Contractors.